Day 2 Arrive in Vienna – Tour the city and return to hotel in mid-afternoon. 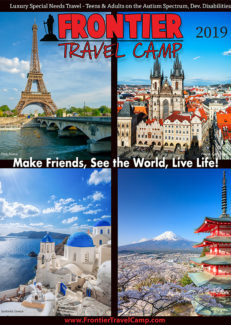 We here at Frontier Travel Camp really like to finish a summer in a way that will keep our travelers talking for weeks and months after they go home. This trip will be no different. Travelers for this final portion of the tour will arrive into Vienna and will have a day to decompress from their travels and will have some time to explore the main sights of the city. Then, we will be off to real diamond in the rough, Slovenia. 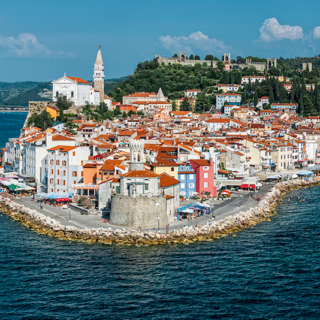 Slovenia is a country that has so much to offer but is seldom traveled to on the European traveler’s circuit. The capital city of Ljubljana sits less than one hour from the beautiful lakes district (pictured left) to the north, and the Adriatic coastal city of Piran (also pictured left), to the west. These picturesque European beauties are just what we need to get away from it all. We will roam around Lake Bled, and wander the old streets of Piran, relaxing in the nature, and breathing in the clean air. Because in a few short days we’ll be partying our nights away on the Adriatic, Ionian, and Aegean Seas aboard the Norwegian Star. 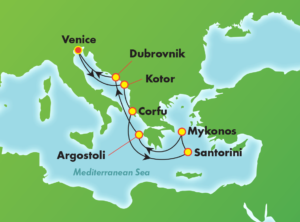 A short drive from Slovenia is Venice, Italy, which is our embarkation point for our 7 day cruise. We’ve had so many requests for another cruise through this region so here it is. We will sail to the amazing ports of Dubrovnik, Croatia (pictured on this cover), Kotor, Montenegro (it’s another WOW destination), Corfu, Greece, the extraordinary island of Mykonos, and the unforgettable island of Santorini (pictured above). Even though we’ve cruised to some of these Greek islands before, their beauty will never grow old. You can’t have too much of a good thing. You won’t believe the beauty in these amazing ports. The best part is that all that you need to see is only steps from the ship’s docking locations in every port. So we will be able to have a relaxing time while seeing everything we would ever want during the day, leaving time for us to party throughout the night. This will be the perfect summer for all of us.